The events of 9/11 have changed each of us – no one can argue this fact; it made the world a smaller and more complicated place. I’m pretty sure everyone can remember what they were doing, where they were when the news filtered through about the tragedy. 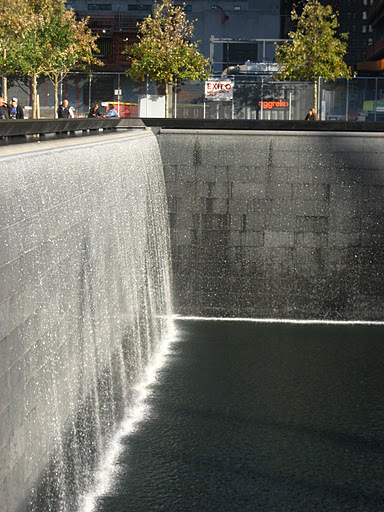 For me, living on the other side of the globe and having no direct connection to the events in 2001, I wondered exactly what my reaction would be visiting the site during my time in NY. Would I be overwhelmed by the emotion? I initially was reluctant to buy into the “hype” surrounding the construction site, a little hesitant to be swept up in all the emotion as I feared it would either be a “show” of American power or a “shrine” tainted with hatred and anger. In the end, it was none of that. It was a juxtaposition or sorts – existing beside the massive void left when the towers collapsed is the city’s busiest corporate area. It is noticeable the defiant statement these workers and companies make; nothing will stop us getting on with business. But little things make you realize that every person is honestly just trying to live in a way they can remember and honour the victims. Firstly, it is important to mention what a fantastic job the volunteers do – those that are involved with the museum as well as the hard working folk who run the walking tours. 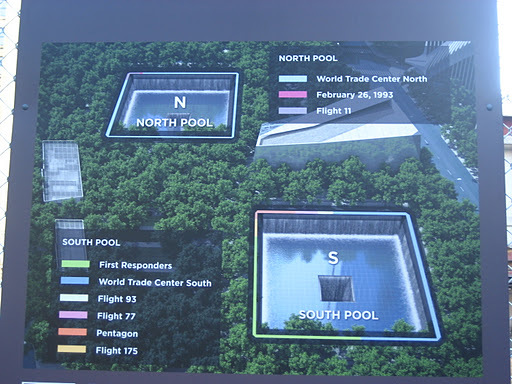 They really to do provide a personal insight that brings the site to life, and will ensure generations to come understand what happened that day. 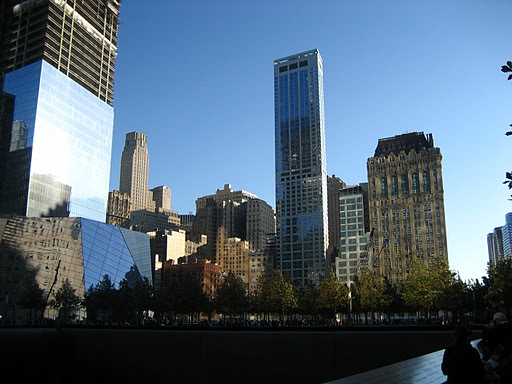 Should you find yourself in NY sometime soon, find a spare half-day and head down to the Tribute WTC Visitor Centre to see the exhibits or take a tour. All volunteer guides are survivors or have personal links to that day in 2001. 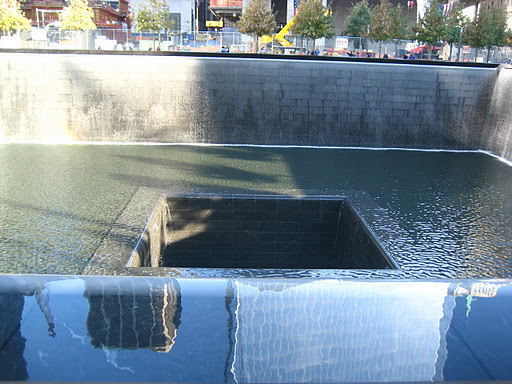 I was lucky enough to get on a walking tour led by two guides – one of which was a “first responder” and lost his brother; the other guide was on duty and in charge of security in the South tower (somehow making it out alive!!). 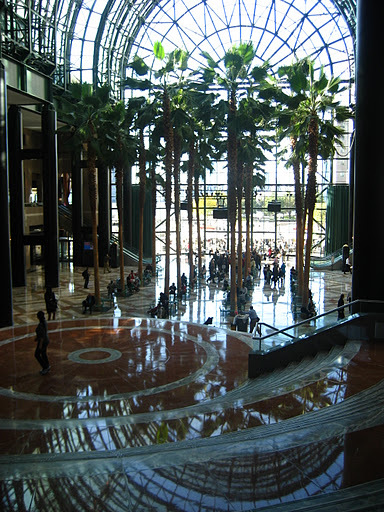 But before I started the official tour, I had time to explore the World Financial Centre – a group of buildings built along the Hudson River, as part of Battery Park City. Believe it or not, this entire section of Manhattan island is “man-made” comprised of landfill and material excavated from the original construction of the World Trade Centre site (the complex was opened in 1973). 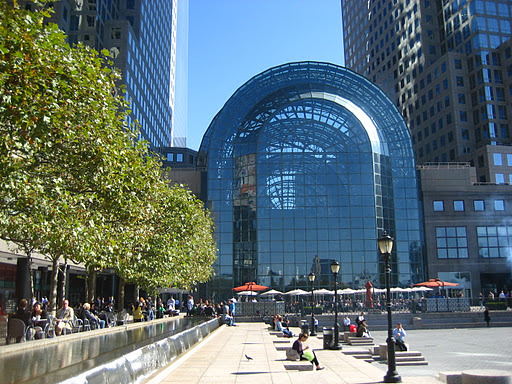 Today, the buildings of the World Financial Centre are inhabited by workers and tourists a-like under very strict security, but it really is a mini-city complete with shopping complex, restaurants, cafes, beauty shops and even holds live music/entertainment for all to enjoy. Although there was no live entertainment the day I visited, I did enjoy a yummy salad and chocolate eclair from Financier Patisserie sitting in the sun surrounded by business workers wheeling and dealing over the phone, or relaxing in the sun. 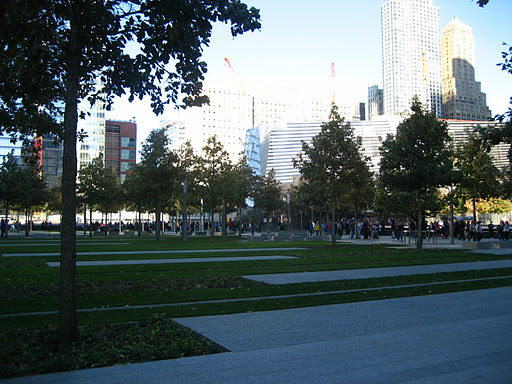 The Winter Garden (below) gives the best views over the memorial site and on-going construction. 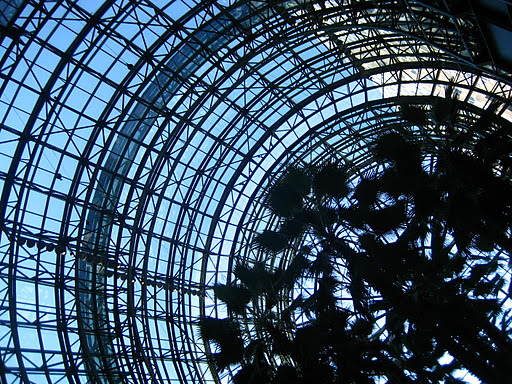 During the reconstruction of the Winter Garden, the whole floor of Italian marble had to be removed and replaced. In fact it was a diplomatic exercise – the Italian government helped source “matching” stone from its quarries because the original source of marble was no longer operating! You cannot tell the difference between what is old and what is new…. 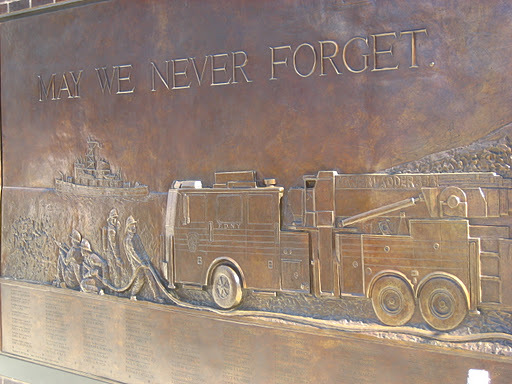 The walking tour began beside the Tribute centre – on the brick wall of NYFD Station 10 is a memorial mural and plaque dedicated to the 343 New York City Fire Department members that died. 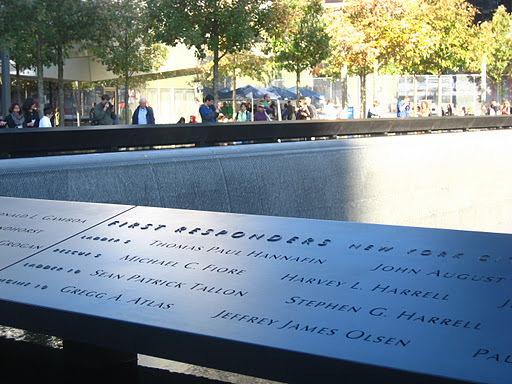 It was installed by law firm Holland and Knight, who lost a partner of their own also involved in the fire and rescue response on September 11. Most of these workers were first responders – some entire squads were lost from stations scattered all over Manhattan. The plaque did not aim to identify any particular station, engine number or ladder – instead commemorate the brave effort of all. It was here that we had our first view of One World Trade Centre a.k.a. 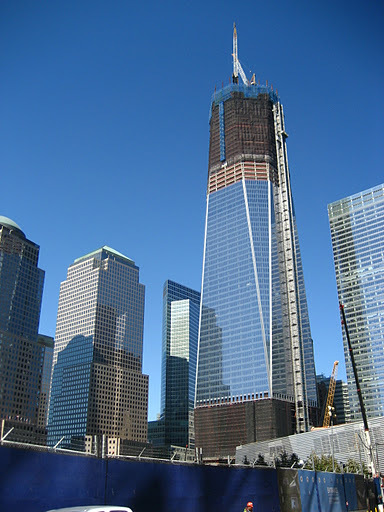 “freedom tower” – which when complete will reach the same height as the Twin Towers were. Currently it is about 80 stories high, so there is still a fair bit more height to go on this building before it gets to 110 stories, or 1368ft!! 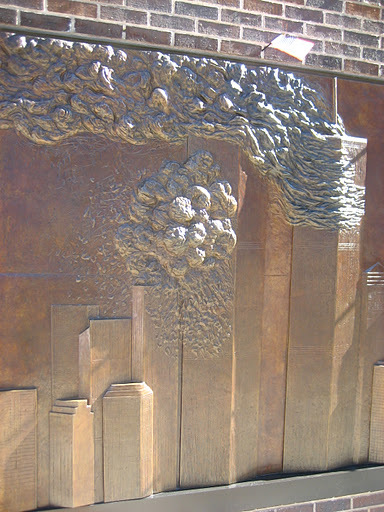 This Southbridge cross-walk is the only original one that survived the impact and collapse of the nearby WTC 7 buildings. 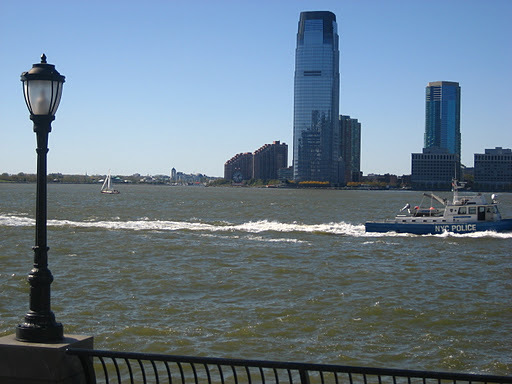 It would have originally ferried people across from the Financial Centre to the Trade Centre complex, near the St Nicholas Greek Orthodox Church (which had to be demolished secondary to damage). 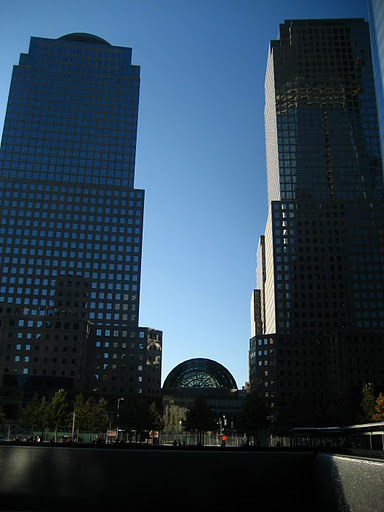 This is also the site of the last building to be demolished in relation to 2001 – the Deutsche Bank Building. 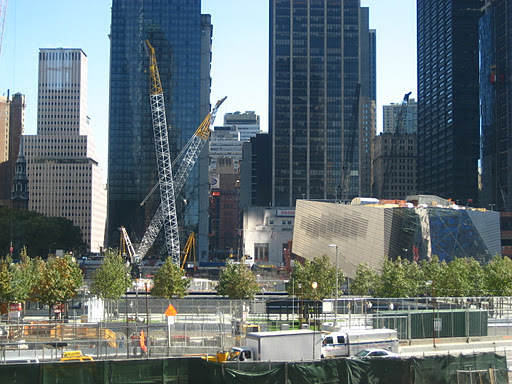 In total, 16 acres were cleared at “Ground Zero”, and will form part of the memorial as well as being rebuilt to house the seven WTC buildings once again. 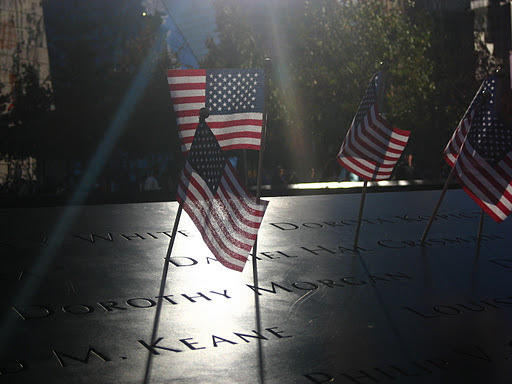 It was amazing and emotional to hear the stories our guides shared…of near misses and fate, of losing loved ones, and the inability to comprehend the scale of the disaster – even when standing amongst the rubble of Ground Zero. It seems stupid to us now, but I’m sure that shock reaction helped many people survive. Where I thought the tour would be sombre and sad it was uplifting to hear the reactions of those who responded to the tragedy – perhaps donating time, money or resources to the recovery. 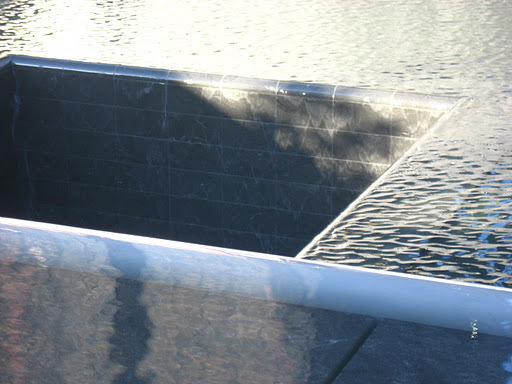 The amazing memorials that have been set up in tribute don’t wreak of anger or sorrow or revenge – they commemorate and inspire us that visit never to forget. 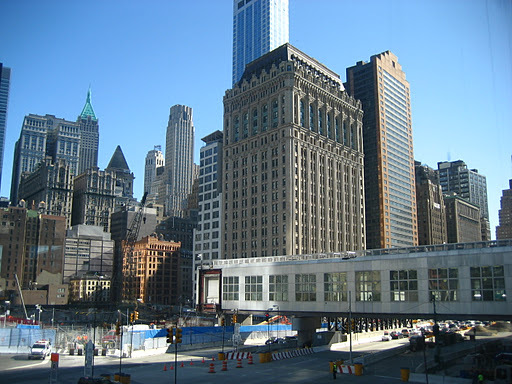 The original mission of the World Trade Centre complex was to “promote world peace through trade” – and hopefully there is plenty of peace vibes that continue to be conveyed in the memorial and museum at Ground Zero when complete. Possibly the most surprising element of doing the tours is that I managed to get entry into the memorial site – despite the fact you need to book online months in advance (they were booked out for 2011 I believe). So from the tour I wandered back around to the entry, proceeded to stand in an endless queue before being searched and x-rayed as if I was hopping on a long-haul flight. Then proceeded on to the next stop – I.D. check. Then again another stop before the entrance to make sure I had a valid ticket!! 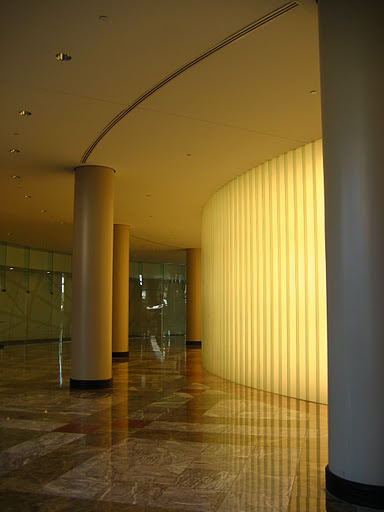 But being inside gave a new perspective to the void left from September 2001 – as well as the remarkable re-build. Part of the “forest of trees” planted on the site around the pools of reflection….there will eventually be over 400 trees planted, as well as plenty of grassed areas and seats for people to stop and reflect. 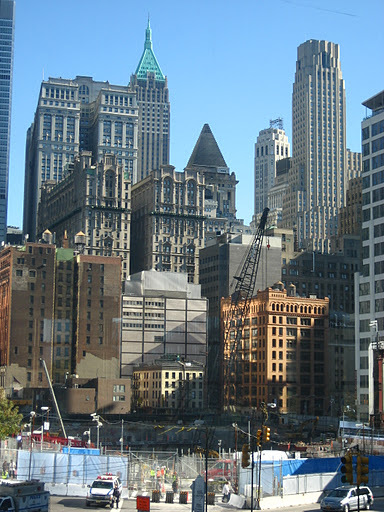 « Getting lost in Midtown…. Amazing part of your trip Jessie! Makes me want to go and have a look at it! Thanks for sharing the photos and story.